JOJ is implemented by VOSD in the area of Tazumuddin Upzila of Bhola district with the assistance of HKI. To improve the health and nutritional status of poor people, HKI supports VOSD to distribute poultry and livestock among the poor families of the area. For this VOSD have distributed 3,500 poultry (1,850 hens and 1,650 ducks) and 2,150 livestock (1,250 goats and 900 cows) to the poor families to improve their nutritional status. Cow and poultry sheds were constructed and people have benefited from these activities. The beneficiaries now get eggs and milk from their own poultry rearing and livestock. They not only consume eggs but also sell them in market and get their protein intake from these eggs. 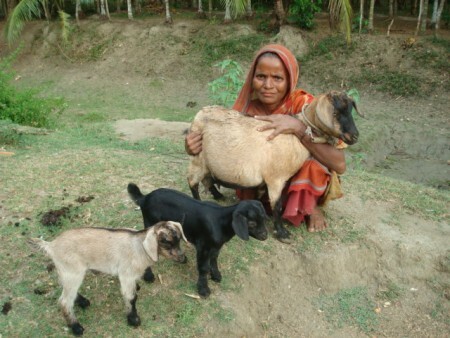 On the other hand, livestock (goats and cows) give milk which also plays a vital role in the socioeconomic condition of the project implementing areas. VOSD also provided necessary medicines to the poultry and livestock of that area. About 32,350 people directly benefited from this project and others indirectly involved with this project.